Whether picnicking out and about or entertaining at home, the Totally Bamboo Lattice Flatware Caddy with Handle is the perfect choice to store flatware, napkins and plates. 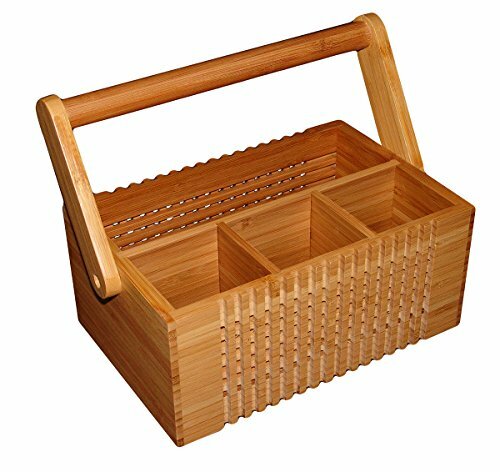 Beautifully crafted from organically-grown Moso bamboo and featuring a gorgeous lattice pattern, this caddy will be a hit near the pool, in the yard, at the park or in the kitchen. The caddy features three flatware compartments to store forks, spoons and knives and one large compartment for storing napkins, plates or condiments. The caddy also functions as an outstanding storage solution for office supplies or crafting materials too. The Totally Bamboo Flatware Caddy measures 10 inches wide, 4 inches deep and 6 inches high. To clean, simply wipe with a damp cloth and soap. Backed by a one year manufacturer's warranty.